…and now my watch begins. Where do the unwanted go? The 4th or 5th sons of noblemen? The petty criminals? The bastards? The leftovers of society that seem to have no purpose? In Westeros, there’s always one place for them, The Wall. Far in the north, The Wall protects Westeros from the wild and untamable things lurking in the forests beyond it. Everyone in Westeros knows that winter is coming, and when it does, it’s going to be the Night’s Watch that man and guard The Wall that are the first and best line of defense. 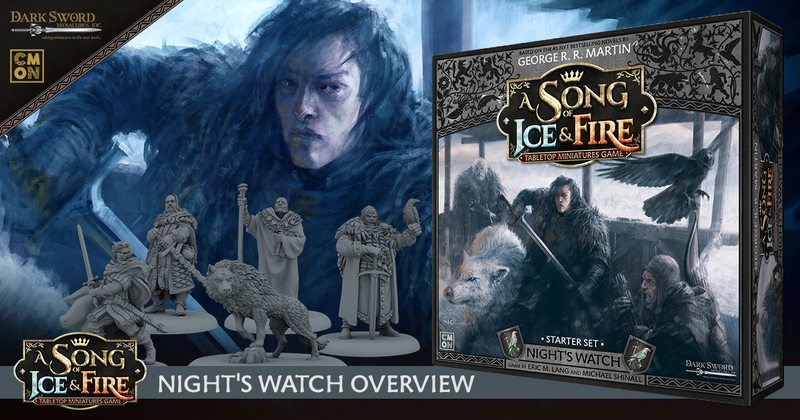 In the A Song of Ice and Fire: Tabletop Miniatures Game, commanders will soon be able to lead their own band with the Night’s Watch Starter Set, utilizing their unique Troops, Characters, and Tactics to defend against any threat. The Night’s Watch is not counted amongst the standing armies of Westeros, and their numbers continue to dwindle as time goes on. This, combined with the myriad dangers awaiting new and inexperienced recruits, means that only the toughest and strongest survive any time at The Wall. In-game, this translates to an army of tough, grizzled, and expensive units. When fielding a Night’s Watch army, the player can almost always expect two things: They are going to be outnumbered, and their units are going to be, on average, much more elite than their opponent’s. To make a quick comparison, we need only look to the Stark vs. Lannister Starter Set. In it, the most expensive Combat Unit is the deadly House Umber Berserkers, coming in at 7 points of double-axe-wielding aggression. While they don’t have much staying power, their offensive capabilities strike fear into opponents. Meanwhile, in the Night’s Watch starter set, we have the grizzled Veterans of the Watch, a Combat Unit boasting superior Defense, Morale, and combat capabilities than almost any previously released unit. Of course, they also come at an 8-point price tag, so you’ll be paying the price for such capabilities. So while the Watch might be few in number, it only makes the ones you do field all the deadlier. The Tactics Board plays a large role with any army, and the Watch is no exception. Whereas the other Factions tend to focus on specific zones (Combat and Maneuver for Starks, Crown and Wealth for Lannister) the Watch has no such incline. In fact, their Tactics Cards make use of the full range of the Tactics Board to various degrees. As such, your opponent will never really be able to counter you by controlling specific zones. Whereas a savvy opponent playing against Lannisters might know to block their preferred zones (Crown and Wealth), because the Watch has no such preferences, preventing them from gaining some sort of benefit each time is almost impossible. This mentality extends to their Combat Units as well. While each unit in the Watch does have a different tactical role to fill, almost all of them are also well-rounded enough to approach opponents and problems in multiple ways. Utilizing this flexibility is paramount to learn when playing the Watch. You will always have a solution to a problem. It’s in learning how to solve that problem that will separate the true veterans of the Watch from the new recruits! And finally, the one aspect that sets the Watch apart from any existing faction would be their unique Tactics Cards, which incorporate the unique Vow mechanic. Essentially, the Night’s Watch Tactics Cards function mostly the same as the existing Stark and Lannister cards with one exception: Most of them carry the Vow keyword and Ability, which states after the Tactics Card is resolved it is then equipped to a friendly Combat Unit, granting them an additional Ability based on controlling a specific zone of the Tactics Board. These effects can range from additional Attack Dice for controlling the Combat Zone, automatically blocking incoming damage while controlling the Wealth Zone, to even placing Condition Tokens on enemies by controlling the Crown. This ties into the aspects of tactical flexibility we previously discussed, as it further allows units to adapt to ever-changing battlefield conditions, switching between mobility, offense, defense, and general trickery on the fly. Bringing us full-circle, this also ties into the “elite” nature of the Night’s Watch as an army. While you will often be outnumbered, with proper application of your Vows and general Tactics, each of your units has the capability to come out on top of any situation, and each unit can suddenly become an unexpected new threat for your opponent. Night gathers, and soon the Watchers on the Wall will take to the fields of battle. Join us next time when we’ll take a more in-depth look at range of Combat Units arriving with the Night’s Watch release!